"Baltimore, a crime-addled, bankrupt city where the people are just struggling to survive day by day." 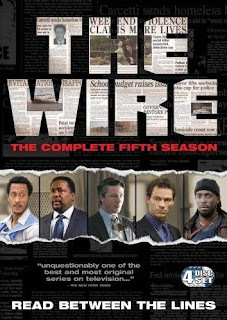 THE WIRE isn't very sympathetic to politicians in general, and certainly the Democrat Tommy Carcetti is given a very rough ride particularly in Season 5, but I think it does succeed in pinpointing the problems experienced by modern American mid-level cities like Baltimore are systemic rather than the result of any particular political philosophy. Something I wished they had raised in the show was a comparison with the way New York's crime rate was slashed shortly before Season 1 began, and perhaps a better explanation of why the same tactics were not applicable to Baltimore (although the theme of the police force being chronically underfunded has been present throughout). This is the greatest television show I've ever seen. Ever since it ended there's been a hole in my television watching that yearns for fulfillment. How did this never win an Emmy? Politics, maybe?